Yesterday, we had family over and as we call ourselves the crazy dining team, we went out in Copenhagen trying some nice food. We went to my favorite Korean place, Ssam. Here you can eat traditional Korean food and drink Korean rice wine. My husband took Bibimbap, which is a rice dish in a hot bowl with a lot of veggies, an egg and topped of with beef or any other meat or veggie choice. I took Chulpan Deopbab, which is fried rice with toppings of your choice, in my case also beef. 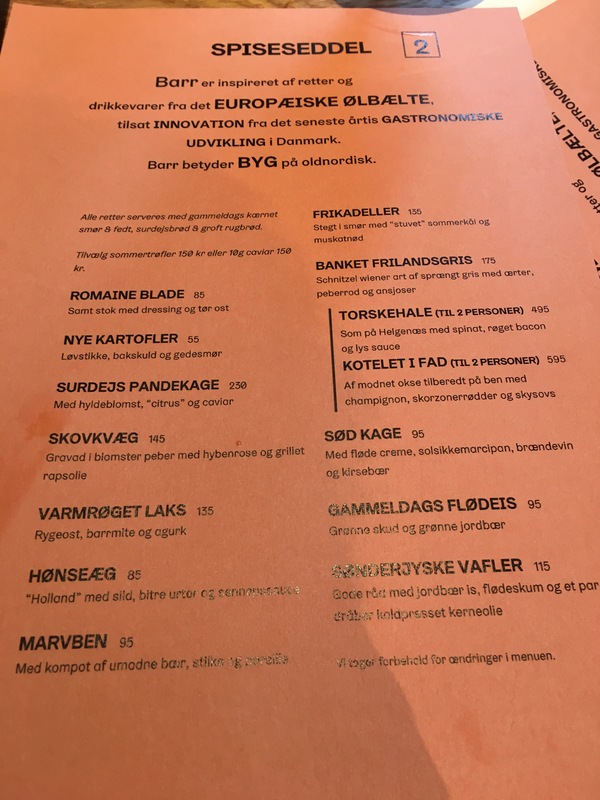 I took a Kissmeyer beer on the side: Stockholm syndrome, a very well balanced double IPA. To go a little crazy, we also ordered Korean rice wine: Makgolli. It is an off-white alcoholic beverage that is sometimes slightly sparkly. They served this drink in a teapot, so I was surprised to taste it was cold. The rice wine is served in funny cups, a very nice experience. The drink tasted a little sweet, milk, astringent and alcoholic. If you like sweet and milk, you should definitely go for it! It is not my favorite, but it was a good experience to try it. We also tried soju, which is a clear distilled Korean beverage, made on rice. The taste is very alcoholic and made me think of sake. Again a nice experience to try it, but as I’m not in to spirits, I was still happy I took a beer on the side as well. Have you tried Korean food? Do you know this feeling that you are always seem to eating potatoes, rice or pasta at dinner? I want to explore new adventurous alternatives to spice up our everyday dinner at home. So here comes the first experiment: cauliflower rice. I did hear of this rice alternative from some colleagues and started to read about it. There are several ways of preparing the cauliflower rice, and I chose the fried version. And yes, it turned out to be very easy to prepare. I started with half a cauliflower and cut the cauliflower in small pieces. As I received a small mincer for Christmas, I used that one to mince the cauliflower into rice looking particles. The last step is frying the cauliflower rice in a pan. You have to start at very low fire with a good amount of oil in the pan. And then you stir and stir and stir until the cauliflower starts to look caramelized. This can take a while and you will also smell the typical sulfur smell during the frying. However, when the cauliflower starts browning, most of the smell is gone. And that’s it, now mix with a nice curry or wok and you’re done! The cauliflower tasted very nice (not so much like cauliflower after the long frying) and fitted very well with the chicken curry we prepared on the side. Have you ever tried a non-starch alternative that you can recommend? Restaurant IBU – fantastic Asian food! 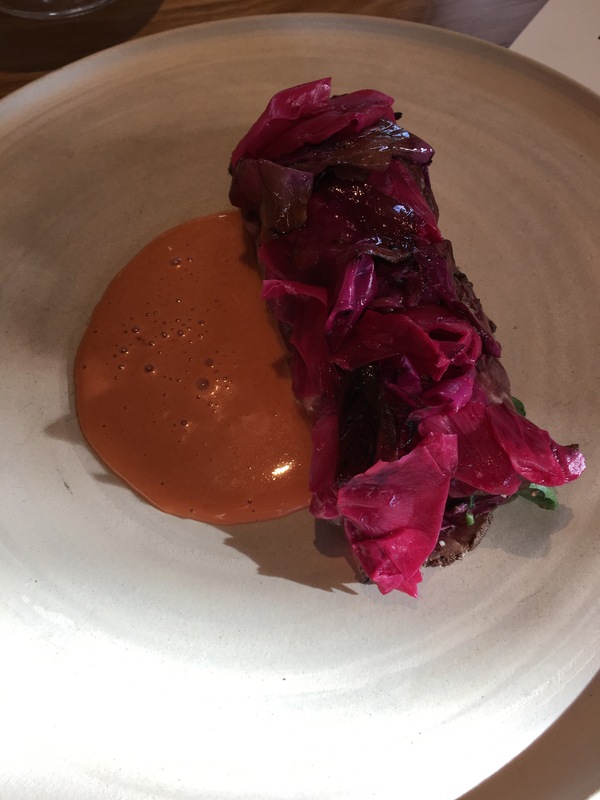 Last weekend, my husband and me tried a (for us) new Asian restaurant in Copenhagen: IBU. We found this one on Earlybird which is a website where you can book a restaurant visit but only for the day itself. I really like this website, as you can just order when you feel like going out later. The restaurants present are of good quality and it is excellent if you want to try something new. The interior was very modern, with a lot of black accents. The first platter (which was 2. Ret on the menu) was tuna with wasabi and beetroot with fish eggs on top. Very refreshing! My husband chose a Møn brown ale to go with the food, while I felt more like a burgundy style Chardonnay. Both seemed to be a good choice :-). The next platter was Indian flatbread with Jerusalem artichoke purée and fried fat pieces (which is a real treat here in DK). An excellent combination of these 3 ingredients, as it was both a little sweet and sour, more like a pancake feeling. Now followed another vegetarian dish with mushrooms, sprinkled cocos flakes and young coriander shoots. We also got a pickled cucumber on the side. Another well-balanced platter with a lot of taste. These were all the ‘first platters’ and it was time for some meat. The first meat dish was spare ribs which was the best dish of the evening. The spare ribs were prepared in a sweet/sour sauce that was quite spicy, simply delicious! The spare ribs were finished with sesam seeds and some greens. The last dish before dessert was beef, which was so tender it almost melted in your mouth. And then it was time for dessert, a passion fruit mousse with vanilla ice cream. Again excellent, as it was a good balance between sweet and sour. 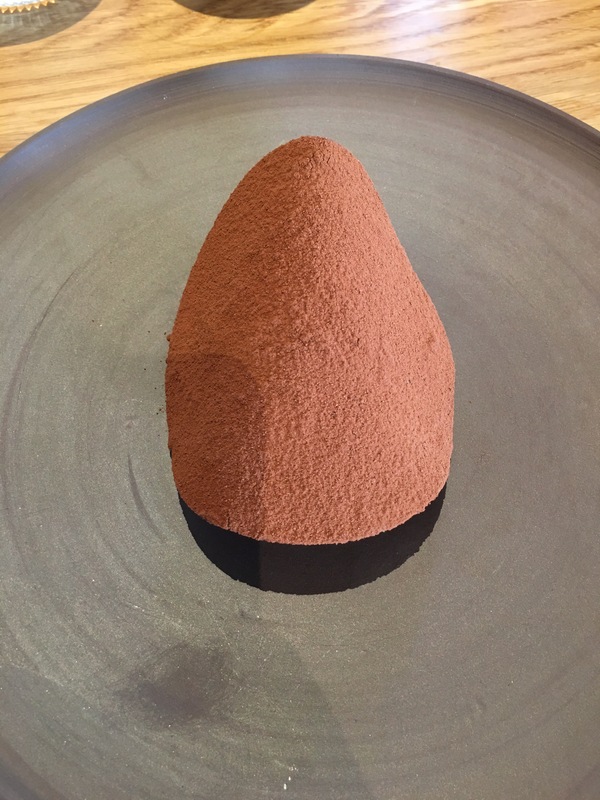 The passion fruit mousse was also extremely light. If you wanna go the Asian way, I strongly recommend to try IBU. One of the best Asian restaurants in Copenhagen! Two weeks ago, my husband and me were on holiday in Catalonia. This is a beautiful region in Spain and despite the trouble they are going through now, I can definitely recommend it for holiday. Especially if you are a foodie, as the regional food and wine are amazing. I wanted to visit a winery and having some wine colleagues all over the world, I asked my Spanish colleague where to go to. He recommended me to go to Augustus Forum, a winery in the Penedes that mainly makes red and white wine, no cava. So off we went :-). The winery is beautifully situated on a hill with a view on the vineyards. When you drive to it, you have to go through an old driveway full of trees. The winery is very modern inside. The name however comes from the long history of the vineyard. 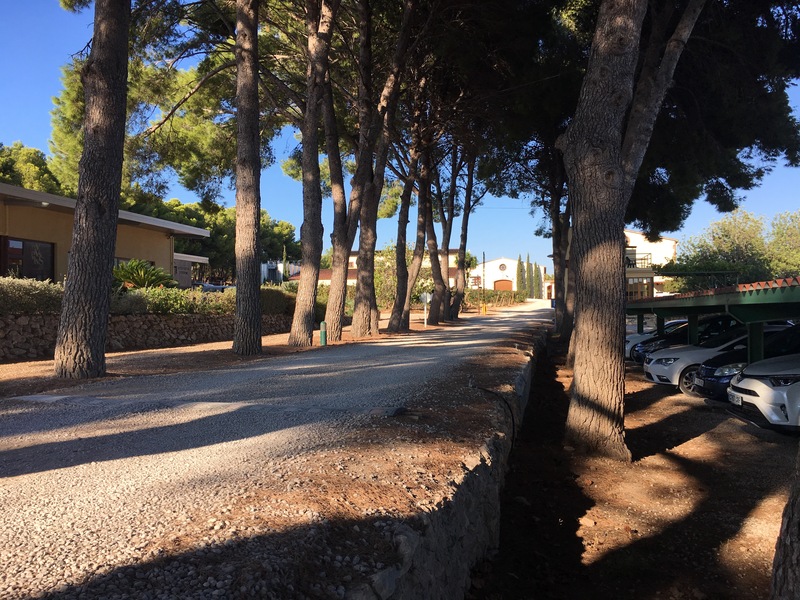 It is named after the remains of what once was the Via Augusta, the Roman road that connected Rome with the most important cities of the Mediterranean. 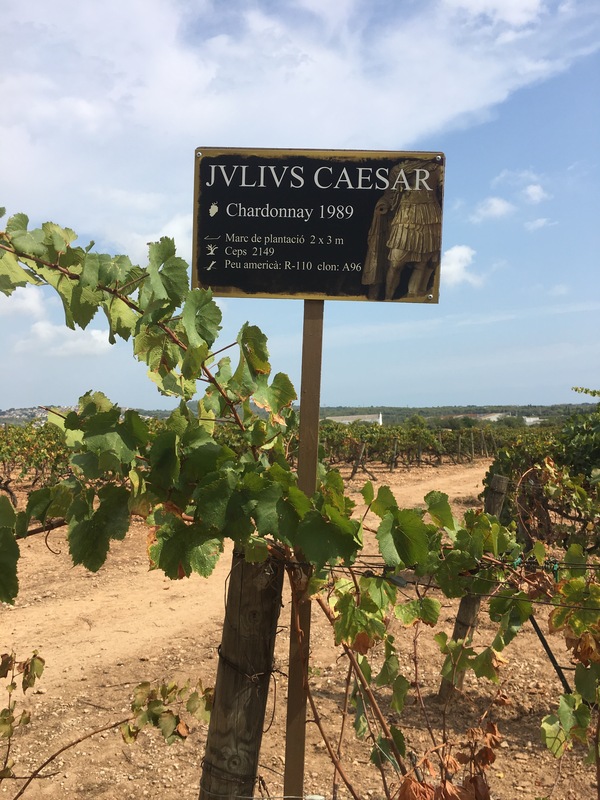 The vineyards are close to the winery and some of them are named after the famous Roman emperors, like Julius Caesar. The wines itself are really good. We got the pleasure of tasting quite a lot of them when we visited the winery. They have their ‘classic’ series like the Cabernet Franc, which in my opinion is the best red wine they have. We also tasted the Chardonnay, which was amazing. Bourgogne style, but way more elegant. As a science nerd, I quite like that :-). 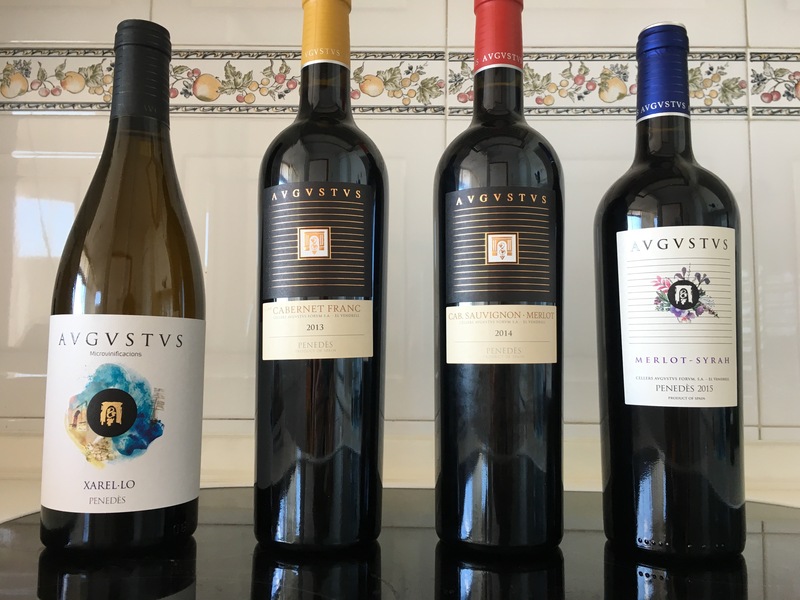 We bought a couple of bottles to taste and were very pleased with both the white and red wines. Definitely a winery to visit if you are in the neighborhood. 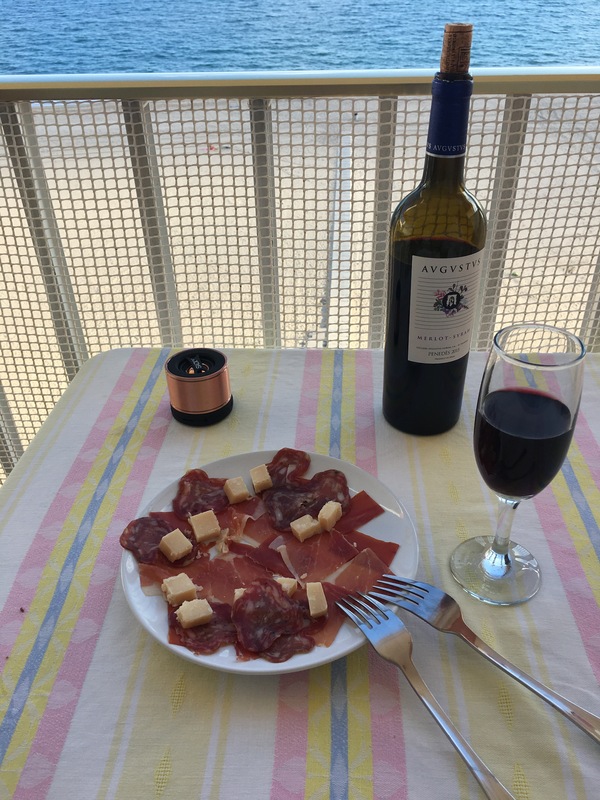 The red wines are also perfectly combined with Iberico ham and cheese, mmmm. Yesterday, my husband and me were invited by our foodie friends at their place for a gin tasting. 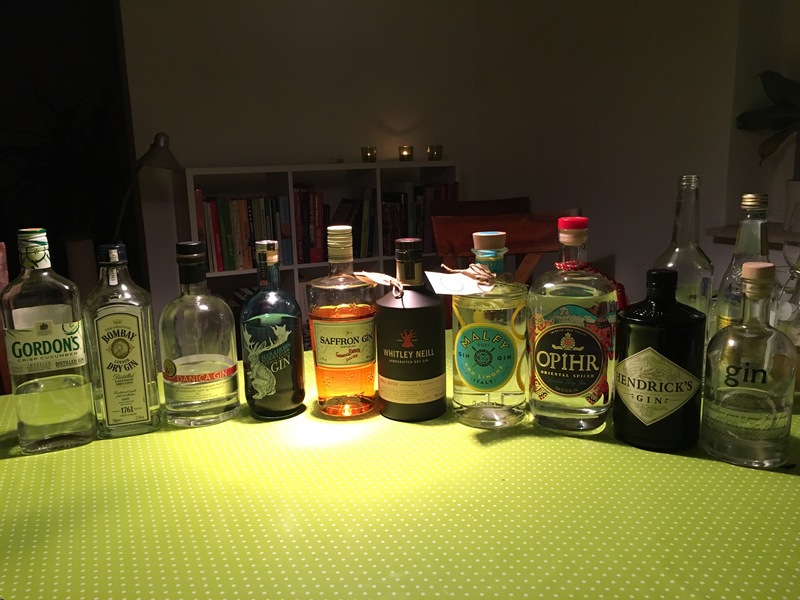 Over the course of a whole evening, we tasted 10 different gins. 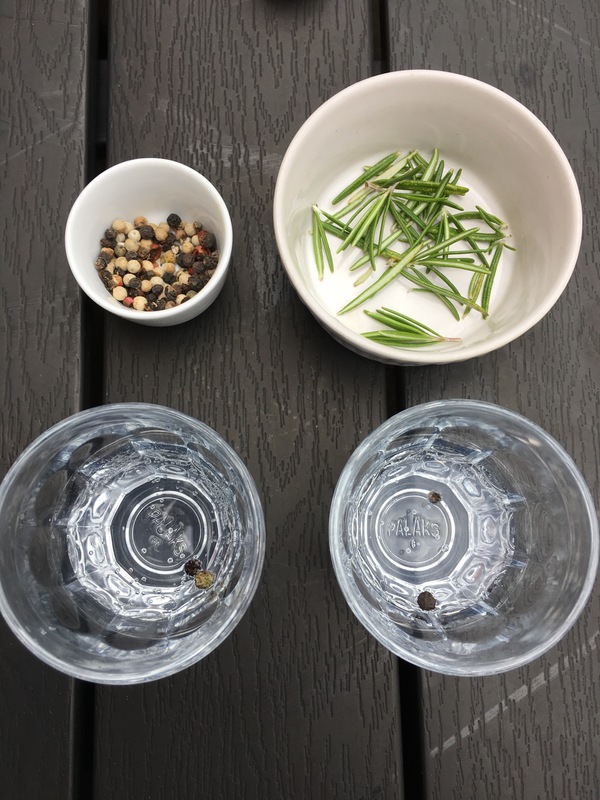 We started off with tasting the gin alone, then mix it with one of the two tonics (Fever Tree and Tonic Mixed from Irma) and eventually spice it up with some extra spices if needed. The line-up of gin showed bottles from 100-300 DK. The gins we tasted were: 1. Gordons crisp cucumber, 2. Bombay London Dry Gin, 3. Danica Gin, 4. Harahorn Norwegian small batch Gin, 5. Saffron Gin, 6. Whitley Neill, 7. Malfy Gin con limone, 8. Opihr Oriental Spiced London Dry Gin, 9. Hendrick’s Gin and 10. Danish Gin. The first two were ok, but definitely nothing special. They were also the cheapest. If you want to use those for gin tonic, I would definitely recommend to spice them up. You can use pepper or burned rosemary for example. The Danica and Harahorn gin were definitely my favorite. Both of them are made with a difference spice and herb mix, and they paired beautifully with both tonic types. They were very balanced and gave a nice spicy flavor. The saffron gin was definitely the worst. This one is distilled over saffron, which flavor – in my opinion – does not combine with the gin and tonic taste. The Malfy gin con limone tasted too much like limoncello, but if you like lemon, just go for it! The Opihr gin was very spiced, the most of all of them, but was nice in combination with the Mixed Tonic from Irma (a more bitter and not so sweet tonic). Not my favorite, because of too much spices, but very balanced if you like some oriental taste. The Hendrick’s gin is the one we normally use at home for gin tonics, and is a very subtile, balanced flavored gin. However, after tasting the Danica and Harahorn, I need to go buy those for future Friday drinks, as they were definitely standing out! Which gin and tonic do you prefer? Bordeaux wines – they are normally not my favorite as it is so difficult to get the wine right before opening a bottle. And then I mean the cellar ageing. How long do you need to cellar a wine before it is drinkable and before it is just the perfect wine? It must be an art to master this. And that is exactly what I would like to learn … by doing :-). Chateau Lamothe-Cissac is situated in Cissac, close to Pauillac, which is the so called Haut Médoc. 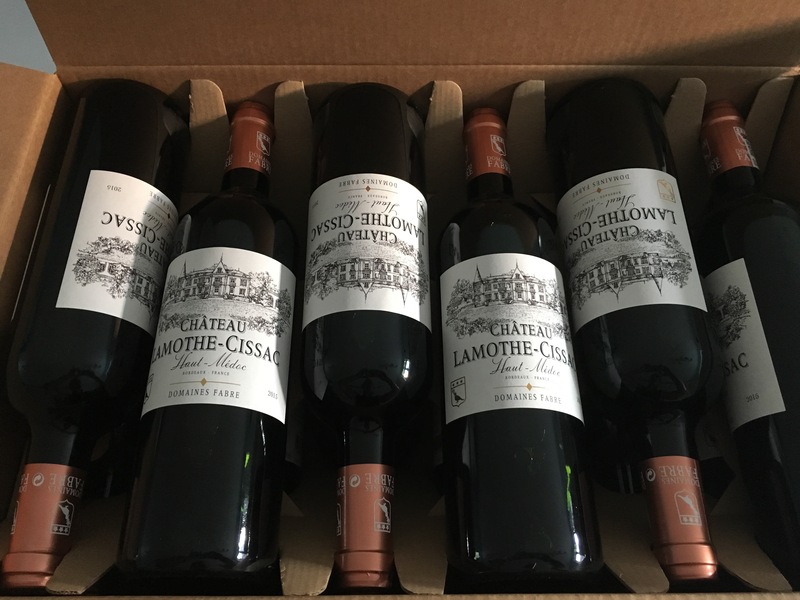 You can find more info on: http://domaines-fabre.fr/en/nos-chateaux/chateau-lamothe-cissac. It will be very exciting to age this wine and taste it in a couple of years. The only thing we will need is … patience. 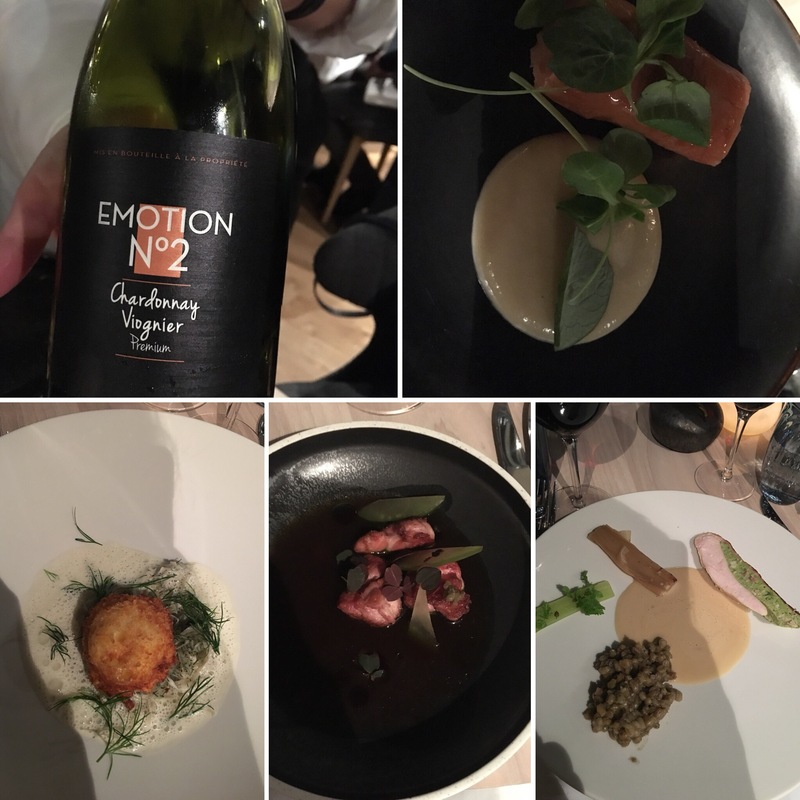 A couple of weeks ago I visited restaurant Barr with some of my favorite foodie friends. 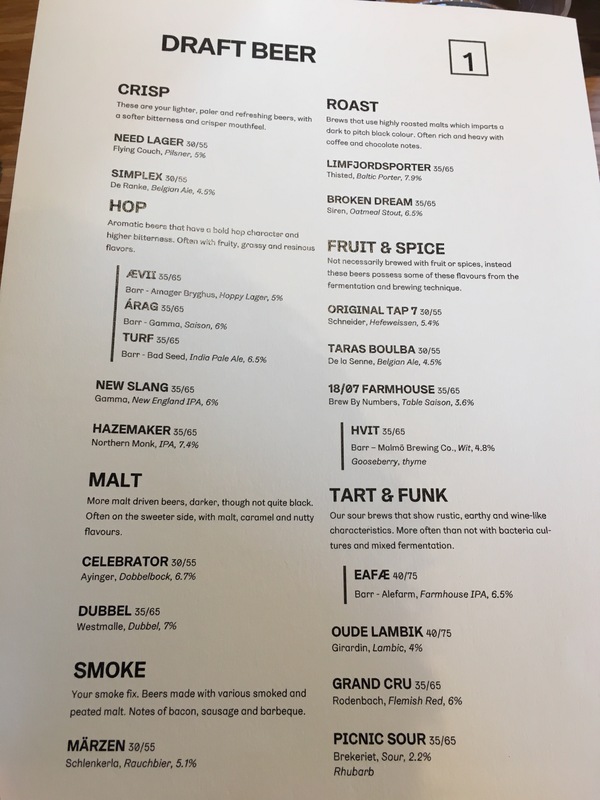 This restaurant opened on 5th of July and had an impressive beer list on draft. 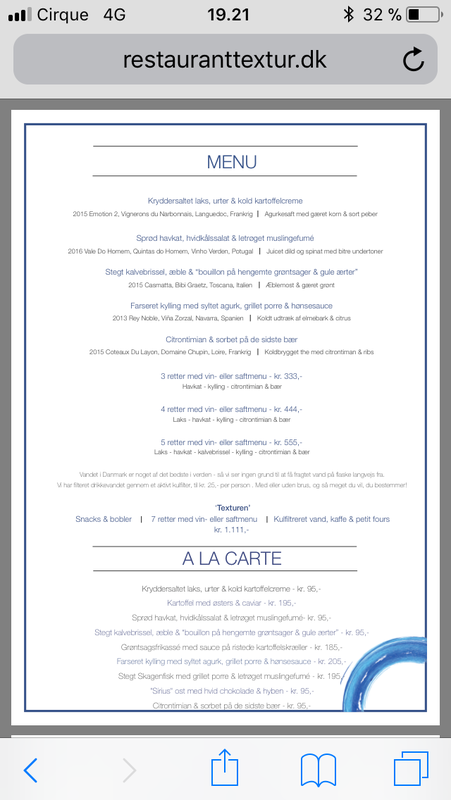 The restaurant is situated in the same building where restaurant Noma has been. 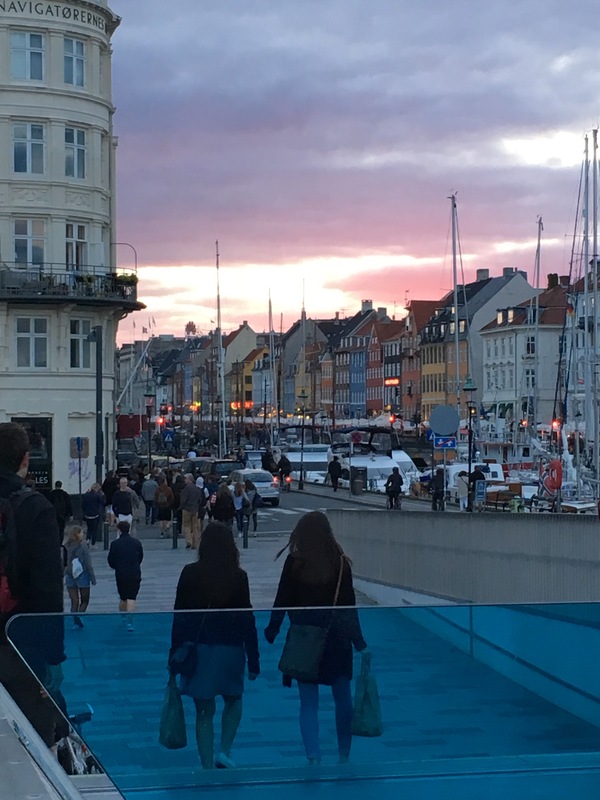 It’s beautifully surrounded by the waterfront and easily to get to due to the bike/walk bridge from Nyhavn. The menu looked so good, that it was very difficult to choose 3-4 dishes, as the waiter recommended us. The forest cattle looked gourgeous. Slices of rib-eye were marinated in flower pepper, hip rose and grilled rapeseed oil. It tasted sublime according to my husband and friends. The flavors melted very well together. 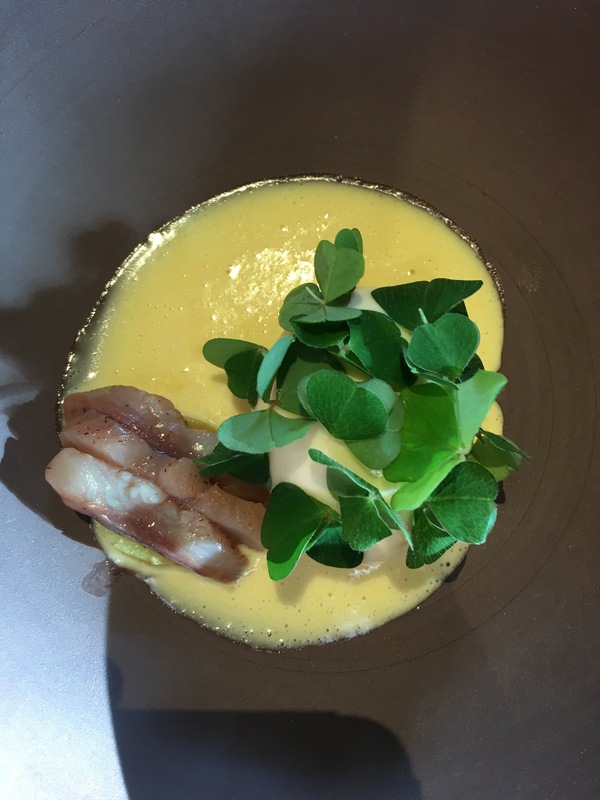 The beer chosen together with this dish was Ævii, a hoppy lager brewed by Andreas Pedersen and Amager Bryghus. The fresh fruity hoppy taste went well with the pepper and hip rose flavors of the marinated meat. I decided to go for the eggs with herring and mustard sauce. The structure of the egg together with the herring was a lovely combination. The mustard sauce fitted very well with the dish and gave it a little bit of spice up. The bitter leaves on top finished it off. 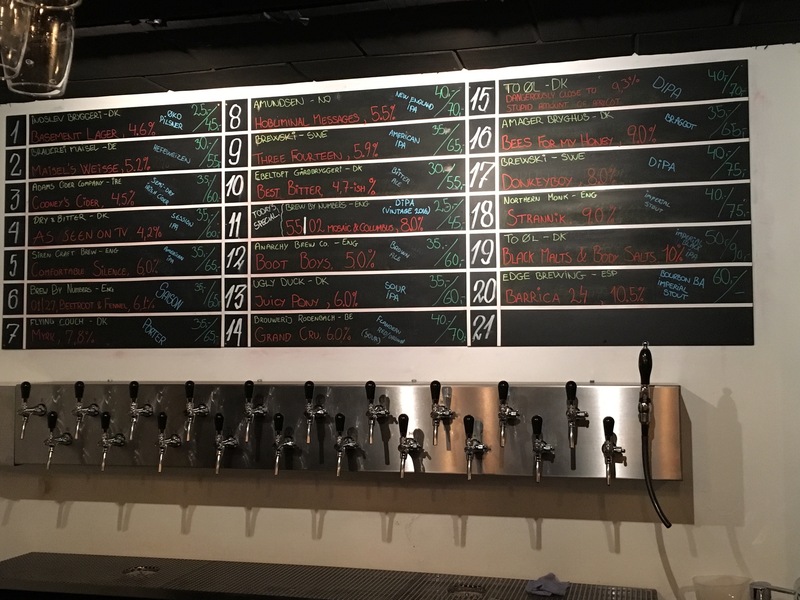 The beer I chose was Arag, the hoppy saison, brewed by Barr’s brewmaster and Gamma brewery. The saison had a slight grassy, flowery taste and was delicately bitter. The bitterness and flowery taste of the beer lifted the dish and went well with the mustard spiciness. 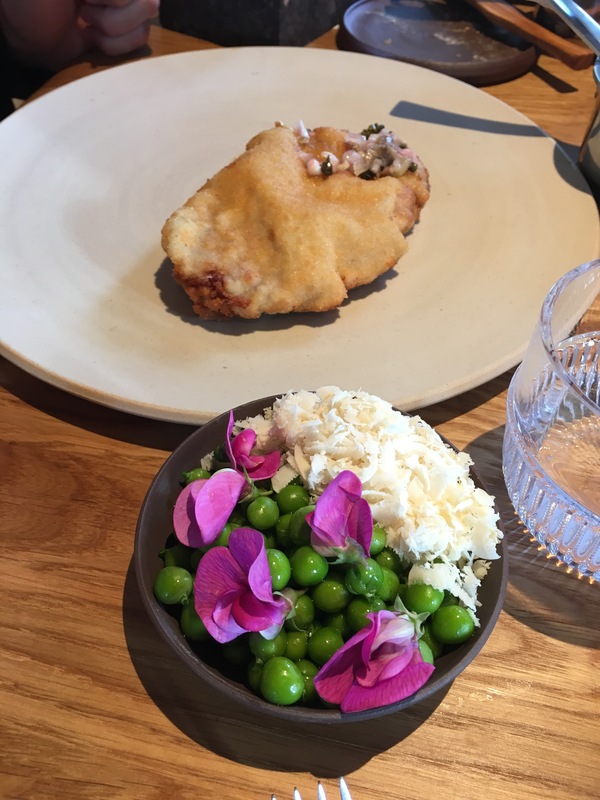 The schnitzel was one of the best my husband had tasted, with a very crunchy crust and a crispy side salad with peas and horseradish. My husband decided it was time for a darker beer together with this pork dish, so he went for the celebrator dobbelbock from Aylinger. Exactly how a dobbelbock should taste: malty, sweet and with a full body. However, it was too full-bodied to go together with the dish. Then it was time for the shared dish for me and my friend. Cod-tail with spinach and smoked bacon. The cod tail was grilled and simply delicious. I never had cod-tail before and I can definitely recommend this dish! The fish meat is so soft it almost melts on your tongue. The dish was so delicious I even forgot to take a picture of it, so let it be a surprise when you’re ordering it at Barr. For this dish I paired it with the Eafæ, a farmhouse IPA collaboration brew between Barr and Alefarm. It turned out to be an excellent choice, Thd Brett flavor and mild bitterness went well with the grilled fish. After this beer, my friends and I shared a Gueuze Boon Black label 2016 from the bottle list. What an amazing beer! Delicate balanced sourness with fruity finish from my favorite Gueuze brewery. Also pairing well with the soft fish meat. And finally after all these great flavor melting pots, we decided we could not leave the place without dessert. So we took the cake with marzipan on top and cream and cherries inside. The best final on a top evening! You’ll see me back for sure 😀. This week I went to an interesting seminar from IDA (the Danish Engineer Association) called ‘Food Trends’. There were 3 speakers, Professor Klaus Grunert from MAPP (Aarhus University), Susanne Kofoed from Landbrug og Fødevarer and Jeff Salter, Innovation Director at COOP Denmark. All three speakers were in general telling the same story, but seen from 3 different perspectives (as researcher, as member of a professional organization for agriculture, food and agribusiness and as innovation director of a big supermarket chain in DK). This is better known as ‘from farm to fork’-responsibility, meaning that you know where all food is coming from and know what is happening at all levels of the food chain. This is focused on both health and sustainability. This is also visible in the ‘clean label’ strategy which a lot of companies are promoting now. No more chemicals in food and beverages are no GMO food e.g. but more ‘natural’ ingredients. Food needs to be truthful, honest and sincere. This is very often a question of communication and storytelling. That is why ‘local’ food is so popular these days. People go back to the farmers in their neighbourhood to buy vegetables and fruits or even meat. 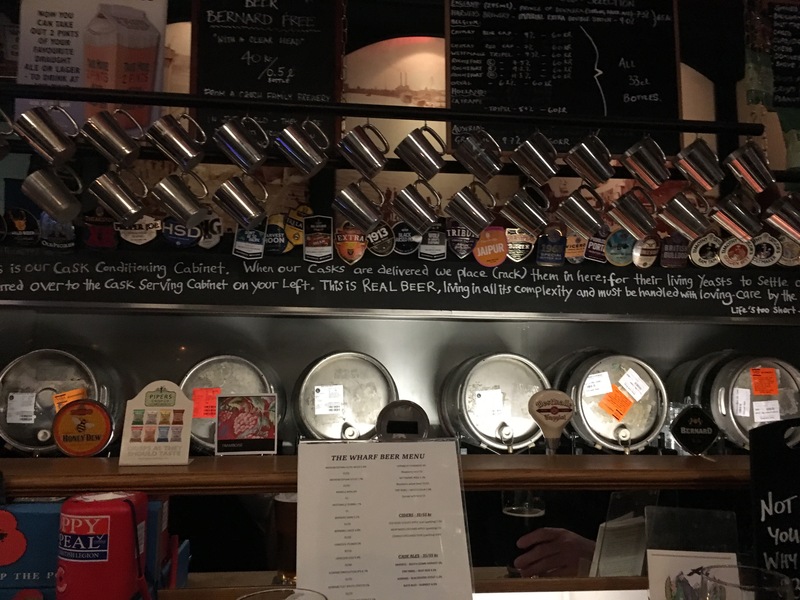 Craft brewing is also a good example, as most craft breweries also started as very small local microbreweries. Eating out or eating in-house needs to happen in a convenient way. Food needs to be ready fast and preferably brought to your house. On top of that, the food needs to be healthy and produced in a sustainable way. In Denmark, aarstiderne (www.aarstiderne.com) is very popular, where you can just order the raw ingredients in all kind of formats (vegetarian, world kithcen, …) and they are dropped at your place. You just need to cook them with the recipe provided and ready is the food in no-time. Or you can go to the supermarket to pick up the raw ingredients in a convenient package that you just need to cook. Another important item mentioned was how all kinds of e-commerce also has found a way into how people get their food. Some people not even go shopping anymore in a supermarket, but order everything online. On the other hand, street foodmarkets and food festivals are getting very popular as well. According to some people, this is beause people become more and more foodies. Especially generation Y is more and more interested in ‘real’ food and I have even heard that young people would go rather to a food festival than a music festival… interesting trend :-).